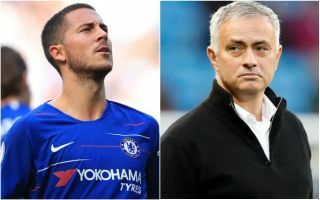 Jose Mourinho continues to be linked with the Real Madrid job since leaving Manchester United – and this could hand a huge transfer boost to Chelsea regarding their star player Eden Hazard. According to Don Balon, Hazard sounds pretty unsure about working with Mourinho again due to his habit of causing conflicts between himself and his players. Although the report stresses that the Belgium international’s relationship with Mourinho is not that bad, one imagines this could seriously affect things in terms of the player moving to the Bernabeu. Hazard’s future has been up in the air for some time now, with the 27-year-old’s contract due to expire at the end of next season. However, if Mourinho gets the Madrid job it is not beyond the realms of possibility that Hazard would end up leaning towards staying at Stamford Bridge. Having been quoted by the Guardian this season as naming Real as his ‘dream’ club, it’s fairly likely that the player is torn between staying at Chelsea, where he is happy and settled, and moving to the Spanish capital to fulfil that lifelong ambition. Although other clubs could be in for a talent like Hazard, if the Madrid option is not ideal, it could be that staying at Chelsea would be his second favourite option. Sky Sports quoted him earlier this week as saying he wants to be a Chelsea legend, which is a decent indication that he may already be planning a stay in west London anyway. If this is how it all ends up working out, CFC fans will have their former manager to thank!